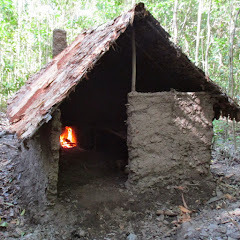 Making primitive huts and tools from scratch using only natural materials in the wild.I also have this blog: https://primitivetechnology.wordpress.com/ (I have no facebook page- ignore the fakes) FAQ Q.Where is this? A.This is in Far North Queensland Australia. Q.Do you live in the wild? A.I don't live in the wild but just go into the bush to make these projects. Also I camp out here occasionally. Q.How did you learn all this? A.Researching books and internet plus trial and error. I'm not indigenous and have no army training. Q.What about dangerous animals in Australia? A.The only really dangerous ones in my area are snakes. Care must be taken when walking about and lifting things from the ground. Q.For the mud huts what stops the rain washing the mud walls away? A.The roof. Q.Why don't you talk in the videos? A.When I watch how to videos I fast forward past the talking part to see the action part. So I leave it out of my videos in favor of pure demonstration.